Product prices and availability are accurate as of 2019-04-20 12:48:02 UTC and are subject to change. Any price and availability information displayed on http://www.amazon.com/ at the time of purchase will apply to the purchase of this product. Author Bookstand is proud to offer Come Up Higher by Bookstand Publishing. Bookstand Publishing offers books by the best indie authors throughout North America and the world. Bookstand Publishing is dedicated to offering original content to a broad audience and promoting great authors, literacy, and freedom of expression. 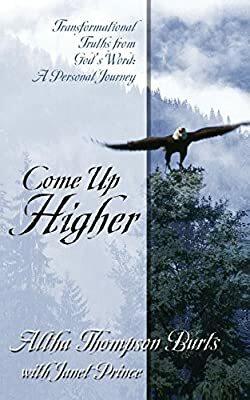 Come Up Higher has generated a lot of interest and excitement and we think it would be an excellent addition to your library. "Altha Burts openly reveals her long struggle to discover her true identity. Her mother died when she was a child. Her father ignored her. Men sexually abused her. She felt worthless, guilty, angry, and confused. Her search for meaning drove her into a lifestyle of emotional dependency, sexual confusion, and drugs, finally resulting in a mental breakdown. Then she found Christ and she became God's beloved child -- not a father's neglected daughter. She gradually changed as she stayed committed to discovering this new life in Christ. 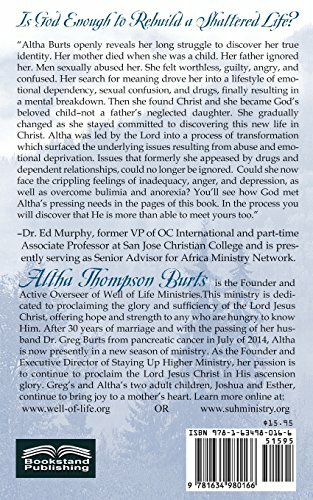 Altha was led by the Lord into a process of transformation which surfaced the underlying issues resulting from abuse and emotional deprivation. Issues that formerly she appeased by drugs and dependent relationships, could no longer be ignored. Could she now face the crippling feelings of inadequacy, anger, and depression, as well as overcome bulimia and anorexia? You'll see how God met Altha's pressing needs in the pages of this book. In the process you will discover that He is more than able to meet yours too." --Dr. Ed Murphy, former VP of OC International and part-time Associate Professor at San Jose Christian College, presently serving as Senior Advisor for the Africa Ministry Network.